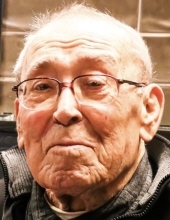 Antonio R. Santos, 98, of Ludlow, passed away peacefully on February 4, 2019 surrounded by his loving family. Born in Evora de Alcobaca, Portugal, he immigrated to the U.S. in 1952 settling in Ludlow where he was a faithful communicant of Our Lady of Fatima Church and member of the former Portuguese American Citizens Club. Antonio worked for Moore Drop Forge/ Danaher Tools from where he retired, and in his spare time, he enjoyed spending time outdoors, hunting, tending to his garden (especially his apples), and reading the newspaper every day; but his greatest joy in life was spending time with his family. Antonio was the beloved husband of the late Alzira (Lucas) Santos who predeceased him in 2015; a loving son of Carlos Rosario Santos and Maria Rosa Assuncao; a loving father and grandfather to daughter Maria Santos, daughter Helena Santos and her husband David Fox and their son Daniel Santos Fox, and his son Jose Santos and his daughter Isabel C. Santos; a dear brother to Manuel Santos and wife Ilda, Carlos Santos and wife Itelvina, Conceicao Baptista and late husband Alberto, Maria do Rosario and late husband Joaquim, the late Jose Santos and widow Ismenia, and the late Venancio Santos and his late wife Maria Olivia; as well as many nieces and nephews throughout the world, several loving extended family members; and dear friends. Funeral services for Antonio are on Friday, February 8th at 9:00am from Ludlow Funeral Home with Liturgy of Christian Burial at 10:00am in Our Lady of Fatima Church followed by burial in Island Pond Cemetery. Visiting hours are on Thursday from 4:00-7:00pm and in lieu of flowers, donations may be made in Antonio’s memory to Our Lady of Fatima Church 438 Winsor Street,, Ludlow, MA 01056. To send flowers or a remembrance gift to the family of Antonio R. Santos, please visit our Tribute Store. "Email Address" would like to share the life celebration of Antonio R. Santos. Click on the "link" to go to share a favorite memory or leave a condolence message for the family.